I’ll be quite frank: I never thought much of Jane Fonda. Growing up in the 80s, the little I did know of her was how many people frowned on her for her stance on Vietnam, how many people bought her workout tapes, and–later–how she married Ted Turner for his money. The first two of those things are true; the latter one is not. Miss Fonda refused any money from Mr. Turner when she left him in 2001. But I’ll get to that later. Jane Fonda was born with the ostentatious name of Lady Jayne Seymour Fonda in 1937 (she’ll be 75 in December of this year). Tired of being called Lady, the tomboy announced to her elementary school class that from here on out she was, “Just Jane, with no Y.” Her bipolar mother killed herself when Jane was 12 and her brother Peter was 10. Though her mother had been emotionally distant and was in and out of mental institutions for much for Jane’s childhood, her suicide haunted Jane (and Peter, obviously) for years to come. But she claims in her autobiography My Life So Far that she took the opposite approach of her brother Peter, who cried and acted out for months after their mother’s death. Instead, Jane became what she termed “The Lone Ranger”; she threw herself into her schoolwork and did not openly cry about her mother’s death until well into her adult years, after plenty of therapy. 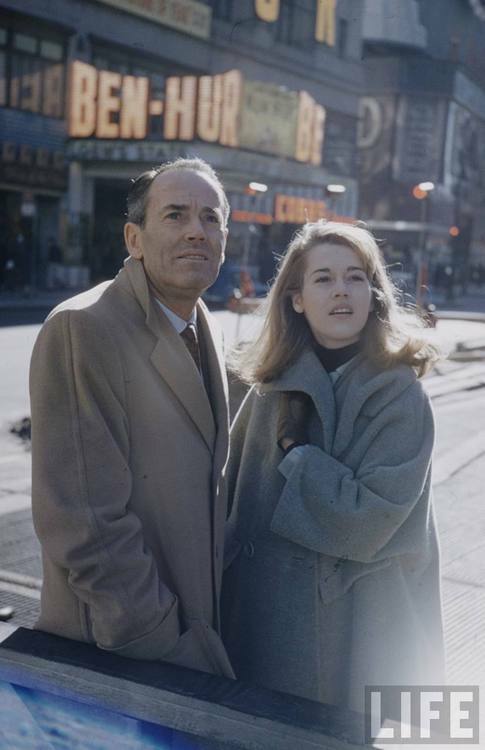 She claims she only saw her father Henry Fonda–whom many have referred to as being stoic and cold–shed tears twice in his life: the first time was when FDR died, and the second and last time was when she poured her heart out to him right before he died. So she came by the lack of tears honestly, at least. But Jane Fonda is anything but cold and stoic. It’s hard to summarize a life as winding and fabled as Jane Fonda’s very briefly. In fact, I won’t even try. She herself takes the liberty of dividing her life up into three acts in her 2005 autobiography. Married three times with two children and numerous step-children (and a black foster daughter whom she rescued from an abusive home in the early 80s), one would think the two-time Oscar winner had it all. But she’s the first to admit the many missteps she’s made, with the infamous “Hanoi Jane” photo from North Vietnam being the mistake she claims is, “unforgivable, and I’ll take it to my grave.” Among other regrets she has are living with bulimia well into her 40s, drinking heavily to numb the pain when she was trying to make her third marriage to a cheating Ted Turner work, and not being an involved mother to her oldest child (her daughter with first husband Roger Vadim, who was raised jointly by Jane in L.A. and Vadim in Paris). 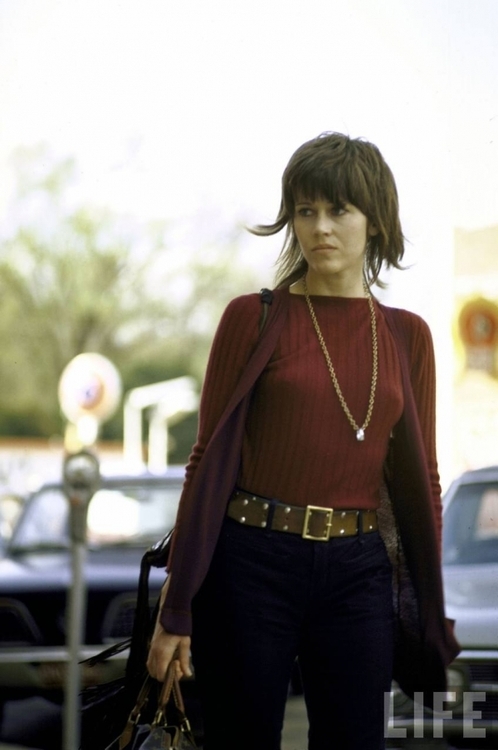 With all that said, Miss Fonda has accomplished much in the film industry, has been a tireless advocate for those she feels can’t speak for themselves (such as the Vietnamese during the war and victims of sexual abuse the world over), and has become a born again Christian after turning 60. 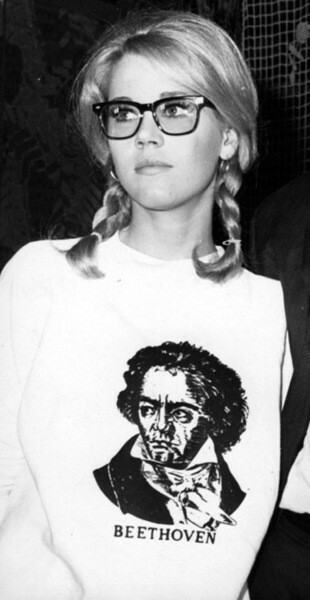 The main thing I took away from her autobiography is Miss Fonda’s profound sense of self-awareness. She admits this is due to years of therapy and schooling herself by reading motivational books, and it shows. But there’s more to her philosophy than just spouting off great quotes and explaining how she overcame the losses of two, very emotionally detached parents and divorces from three powerful men. After 62 years on this earth, she found her true self in the year 2000. How many people can really say that? Think about it…not many people take the time to truly find themselves. We all get so wrapped up in our shoehorned roles (those we think we are stuck in and limited to) and what we think this person thinks of us or that person expects of us, that we lose sight of our true calling. Many people didn’t agree with her anti-Vietnam activism, but she stayed true to herself. She could’ve just as easily stayed put in France and/or Hollywood and made more 60s fluff films, but she knew in her heart of hearts that she couldn’t do that. Whether or not one agrees with her political stance, it’s admirable that she got out of her comfort zone to do what she felt like was right at the time. She also admits in the book that she has a tendency–to this day–to speak before she thinks. I empathize with her on that point, as most of us who have this character flaw mean well in spite of all the feet we put in our mouth. The last quote, and the one most applicable to the theme of this blog, actually takes up the entire page 563 of My Life So Far. 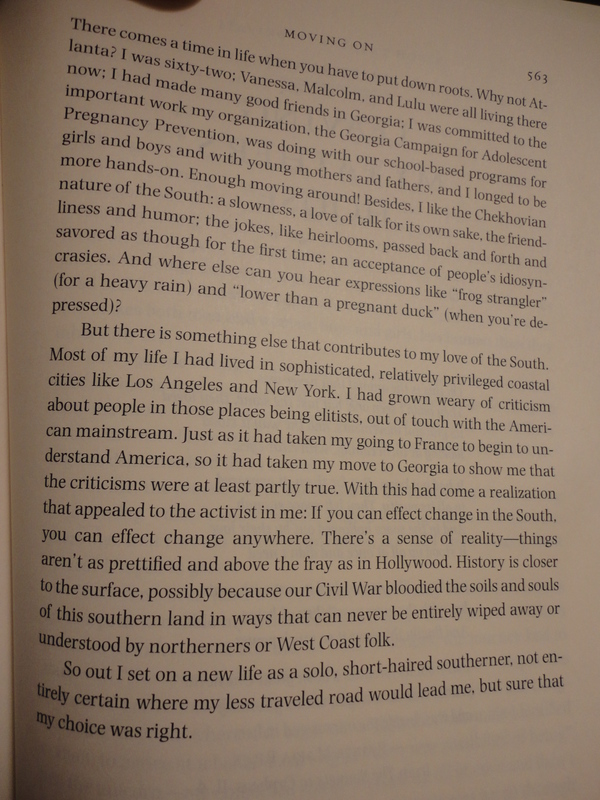 You should be able to click on the photo I took of the page below if need be and read it easily (and plus, the font of this book is very pleasing–Miss Fonda notes that it’s Photina, a typeface designed by Jose Mendoza in 1971). In a nutshell, Miss Fonda is explaining why she decided to stay in Atlanta after her divorce from Ted Turner. (Spoiler: Southerners are nicer than most other people, and they stay truer to themselves and their heritage.) By the way, the reason she didn’t get any money in her divorce from him is because she didn’t need any. Having acted, produced, and owned her own business (Jane Fonda’s Workout), she refused to take a dime from him. Good for her! Though she has since sold her condo in Atlanta (or at least, she rents it out) and moved back to L.A. to enjoy a career renaissance and a new boyfriend (music producer Richard Perry), Jane Fonda still considers herself a proud, adopted Southerner, as she very well should. I’m ashamed after reading her delightful autobiography that I, like many people, judged her at face value as just another pretty face who’s been married too many times. But the same could be said of Liz Taylor, and her activism for AIDS research has already outlived her. One other thing I wanted to add is a line from her “About the Author” notes on the inside back flap of the dust jacket: “[Fonda] now focuses her time and energy on activism and philanthropy, in such areas as adolescent reproductive health, pregnancy prevention, and building resiliency in girls and boys by addressing destructive gender stereotypes.” Destructive gender stereotypes…think about that for a moment, if you never have. 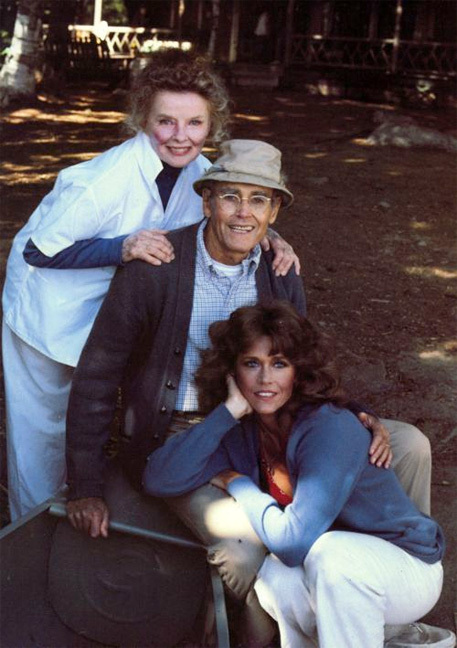 Miss Fonda’s blog, which is very informal and full of great snapshots that she’s so fond of taking, can be seen *HERE*. My Life So Far, which I highly recommend as possibly the best celebrity autobiography I’ve ever read, can be purchased *HERE*. 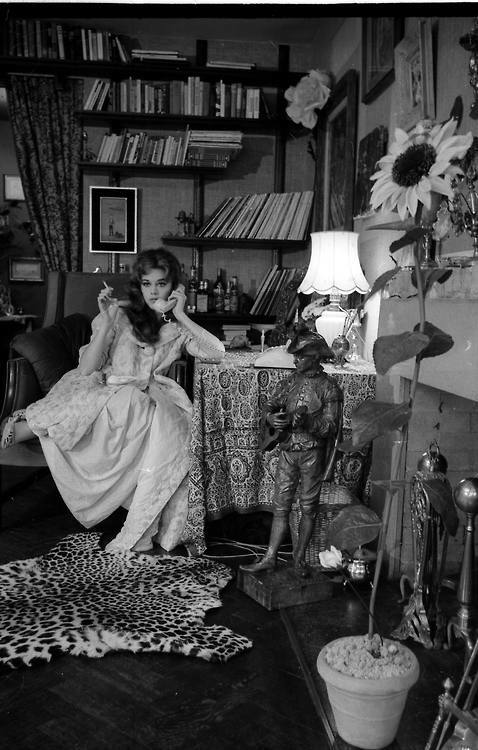 If you’ve made it this far through this rather lengthy book report blog entry, might I reward you with some more breathtaking photos of Lady Jayne Seymour Fonda, AKA “Just Jane, with no Y.” There’s also a final, smashing quote from her at the very bottom of the blog entry. Thanks, as always, for reading my ramblings! 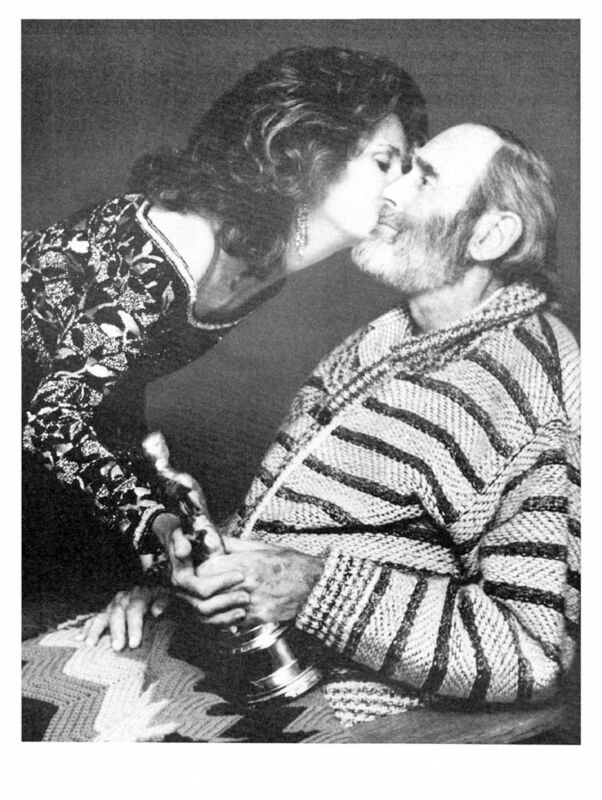 Jane presents her father his Best Actor Oscar for ‘On Golden Pond’ in 1982. He was unable to attend, so she accepted it for him. He died five months later. Miss Jane Fonda in 2012…if you got it, flaunt it!